We manufacture kitchen front door panels, cabinet doors for the furniture industry. 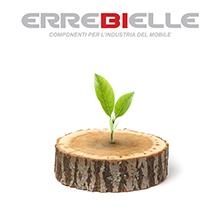 Errebielle is an Italian company specialised in cabinet doors and furniture accessories. It has has been operating for 25 years on an industrial plant of an area of over 32,000 m2, producing solid wood, veneer and MDF, cabinet doors and panels in classical and modern styles for the most important producers of kitchens, living spaces, bedrooms and bathrooms. It has become one of the leading companies in this sector for the high end of the market. We have organisation and production skills typical of a A-Z manufacturing company: 60 employees, production capacity of 4000 doors per day. We have a highly qualified, long serving staff. Our Technical Department, Research and Development and Painting Department guarantee continuity over time in terms of quality and services. Customised products which are custom-made on the basis of our clients’ requirements. Ability to match the standards required by the market on big commissions. A painting plant capable of offering maximum flexibility to our clients. We have built our identity on the “excitement” of having a beautiful kitchen or a beautiful piece of furniture in the house. Experience, technology, innovation and design are the elements that characterize our work and help us building our reputation. We always take care of the best packaging to ensure the customer will receive intact and properly done items. Top Level Equipments and expert people in this sector let us produce traditional and modern style doors and accessories to satisfy every request by our customers. Choosing best quality materials, we are able to produce high end doors with very little rejects, optimizing both production and final costs.